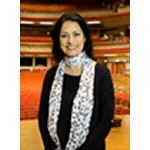 Anita is currently Chair of Performances Birmingham PLC (Town Hall and Symphony Hall), Chair of Creative City Partnership, Director of Greater Birmingham and Solihull LEP (Local Enterprise Partnership), Non-Executive Director Birmingham Women’s Hospital, and Chancellor of Birmingham Children’s University. Anita is also a member of Council at Warwick University and a Governor of the Royal Shakespeare Company. Anita’s media career has been extensive of which over 25 years were with the BBC; from setting up the BBC Asian Network to a news correspondent, documentary maker to being Head of Political and Community Affairs in England, then Head and Editor of the BBC’s Public Space Broadcasting. In 2009 she was awarded an OBE for her services to Broadcasting and Communities. In 2012 Anita was the High Sheriff for the West Midlands.